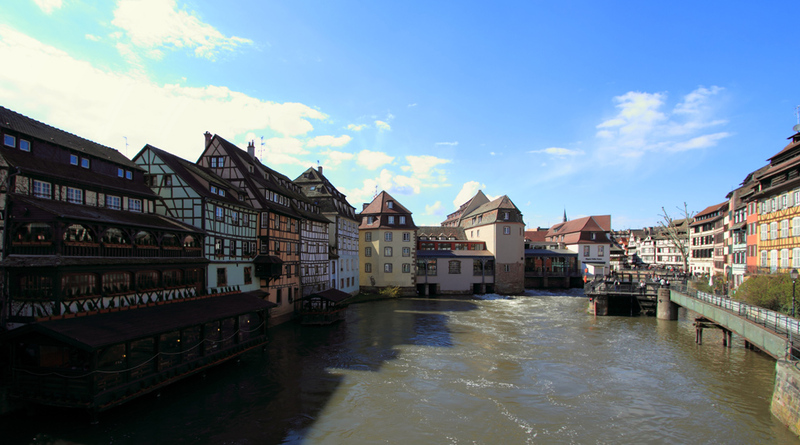 The German-sounding city of Strasbourg is these days part of France, sitting at the eastern border marked by the Rhine. Despite a tumultuous history involving various powers and authorities, it now serves as home to various institutions that seek to ensure unity, such as the Council of Europe and EU parliament. For our first international trip together, my girlfriend and I arranged a visit over the Easter weekend. Although she had fond memories from two previous visits, this would be my first; in fact, it’d been fifteen years since I last visited France! None! Deferring to my girlfiend’s rather greener approach to travel, we took the train. Or rather, two: The Eurostar service linking England to the mainland via the Channel Tunnel; and France’s highspeed TGV onwards from Paris. Both were firsts for me, and so I wrote up the experience over on Flyertalk. The river Ill weaves its way through the city, creating a central island where the most historic buildings can be found. From afar and up close, the skyline is dominated by the gothic bullk of its cathedral, which was the tallest building in the world for over two centuries – despite never being completed. But exploring by foot reveals a wealth of medieval timber buildings – a particular delight is Petite France, which leads to a series of quays and two particularly impressive bridges, Pont couverts and the Barrage Vauban. This all makes for a compact, highly walkable city centre which rewards relatively aimless wandering with a steady supply of architectural treats. There’s no shortage of good food stops, either! When the weather briefly failed to cooperate, we took to the Museum of Modern and Contemporary Art, just behind the Barrage; in better conditions, we ventured north by hired bikes to the woodland of Robertsau and along the Rhine. Having compromised on the mode of transport, I got to make the call on where to stay. Playing it safe – and wringing a last few benefits from my status – I opted for the Hilton. Although not right in the centre, this was within comfortable walking distance and proved to be a good starting point for our bike tour too. As luck would have it, we scored an upgrade to the executive level; more details on the facilities are in my Flyertalk report. Part of my girlfriend’s pitch for Strasbourg was that we could quite possibly eat our own bodyweight in excitingly-topped thin foodstuffs. Our short visit took in French crepes with nutella, German flammkuchen in gratinée style, and Turkish pide almost a metre long. But the definite highlight was dessert-for-dinner at La Plouzinette. 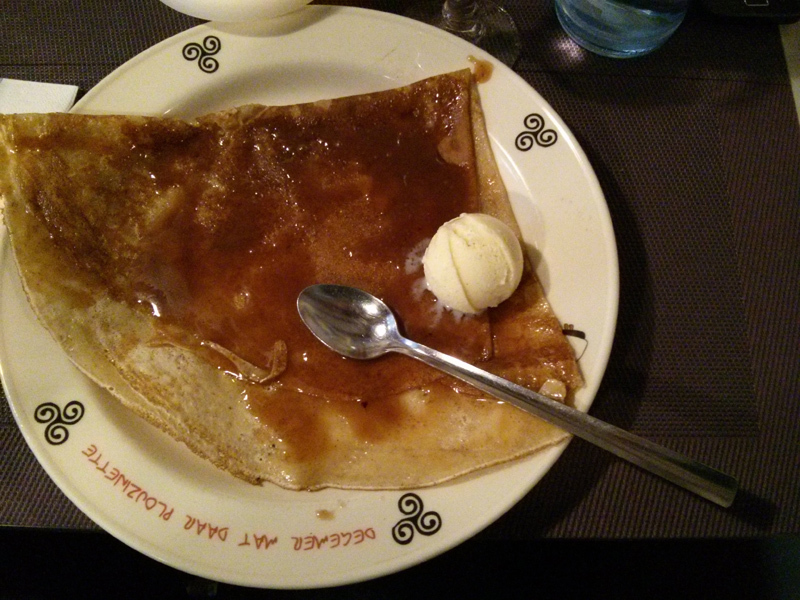 Whilst they offer an impressive looking range of savoury galettes, we homed straight in on the salt caramel crepes. Excellent pricing and a very central location made this one a winner!